In the spring of 2004 two parents began the challenging process of starting a foundation at Vista del Mar Elementary and Middle School. Formally established and recognized in January 2005, the Vista del Mar MAKO Educational Foundation (MAKO Foundation) is a volunteer-led, non-profit 501(c)(3) organization governed by the Internal Revenue Service. Its board of directors consists of five parents who represent the members and work under the direction of the school’s principals, Jim Sieger and Scott Young, to provide financial support for educational and enrichment programs. Currently, Vista del Mar is the only elementary and middle school with a foundation in San Clemente. The MAKO Foundation strives to make a direct impact on students in the classroom by generating revenue through three main resources: annual memberships, sponsorship donations, and special events. In October the MAKO Foundation held its second annual membership kick-off and association meeting at Heritage Grille at the Talega Golf & Country Club, it was an event sponsored by Hopkins Real Estate Group and Talega & Associates. Jerry Miyahara, Chief Financial Officer of Talega Associates, LLC says, "Talega Associates, LLC, proudly sponsors the MAKO Foundation in its purpose to support and enrich the educational experience of the children of Vista del Mar School." The evening was well attended by the school’s teachers, parents, and sponsors who enjoyed an address by both principals, an informative video presentation, and a question and answer segment. Last year, funds raised through memberships went to upgrade the school’s computer lab with the installation of a ceiling mounted projector and teaching screen enabling large group instruction. Funds also went toward the joint purchasing of pedometers with PTA to support the middle school’s “No Heart Left Behind” physical education program. 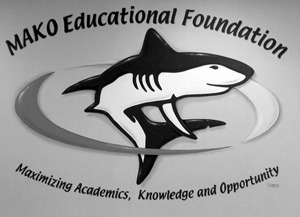 This year, as part of the MAKO Foundation’s membership drive they reached out to members of the Vista del Mar professional learning community to seek sponsorship for their “MAKO Wall of Giving.” The Wall, unveiled in June and created by Kirk Waterman of Waterman Creations, is a masterful work of art featuring the school’s mascot, the names of the Wall’s sponsors, and the names of the Foundation’s MAKO members. The local community sponsors include: Mark Batesole, D.D.S., M.S., Orthodontics, of San Clemente Dental Group; Hopkins Real Estate Group, Inc. & Talega Village Center; Mathnasium, The Math Learning Center; and Eugenia L. Weiss, PsyD, LCSW, Child, Adolescent and Family Psychology. Dr. Batesole agrees adding, "The majority of my clients are children, and I find myself talking to them a lot about school when they come in. I felt it was important to give back to the community in a way that would benefit their education." Kapil Mathur, owner of Mathnasium, also feels strongly about giving back to the community his business resides in and says he hopes to become involved in school activities at Vista del Mar and at schools throughout the community. “The Mako Foundation and Mathnasium have the same goal—to help the kids in our local community succeed in life. The Mathnasium program treats every student as an individual and I know that one of the main themes in the mission statement of the MAKO Foundation is to treat each student as an individual—that alignment makes our partnership a perfect match,” says Mathur. In addition to membership dues and sponsorship donations, the MAKO Foundation relies on an annual fundraiser as a significant source of income. Last year’s inaugural event was a nostalgic ‘80s themed “Parents’ Prom Night” featuring the band Flock of 80’s, silent and live auctions, and a sit down dinner. The event was attended by approximately 200 people and was hugely successful raising over $30,000 in one evening. 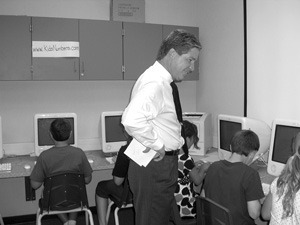 The funds raised went directly back to the school to enrich the elementary school’s Technology Instructional Center program and to upgrade the middle school’s computer graphics classroom ensuring that students stay competitive in the technology world. Currently the Foundation is in the process of putting the final touches on their second annual fundraiser: a fun-filled Casino Night at Heritage Grille at the Talega Golf & Country Club on March 8, 2008. It’s an event they hope the community will enthusiastically support. Already eagerly looking forward to supporting the event and continuing their association with the MAKO Foundation is Jeff Hopkins of Hopkins Real Estate Group. Hopkins says, “Hopkins Real Estate Group believes in fostering the symbiotic relationship between the community and Talega Village Center. We are proud to be a sponsor of the MAKO foundation and believe that every dollar provided to support the learning and enrichment for tomorrow's leaders will be rewarded ten-fold.